The Royal Palace of Caserta, famous for its massive size and opulent style, is a triumph of late Italian Baroque architecture. The largest royal residence in the world, the palace, a UNESCO World Heritage Site, shares a number of features with the Palace of Versailles and is one of the most-visited monuments in southern Italy. The 18th-century Royal Palace (Reggia di Caserta) was built by the architect Luigi Vanvitelli for the Bourbon kings of Naples. It sits majestically on a hill overlooking its 300 acres of undulating grounds, including ornate fountains and water features and the English Garden, one of the most important botanical gardens in Europe. The palace, inspired by Versailles in France and similarly opulent structures in Madrid, includes 1,200 rooms on five floors, including royal apartments, the Throne Room, the Palatine Chapel, and the Grand Staircase, all sumptuously decorated with frescoes, marble, and gold leaf. The Royal Palace and park are among the most popular attractions in the region of Campania; the best way to fully appreciate its architecture and history is by taking a private guided tour of the palace and its beautiful gardens. As one of the largest palaces in the world, visiting the Reggia di Caserta is a mammoth undertaking. You’ll be spending most of the day on your feet, so be sure to wear comfortable shoes and clothing. If you don’t want to tour the grounds on foot, you can rent a bike, take the bus, or opt for a horse-drawn carriage ride. The palace and grounds are wheelchair-accessible. Star Wars fans may recognize the palace as the setting for scenes from Episode I and Episode II. The palace is located in Caserta, just north of Naples—it’s an easy day trip from Naples, Sorrento, the Amalfi Coast, or Rome. (Exit the Autostrada A1 at Caserta Nord.) You can also take the train right to Caserta. The Reggia di Caserta is open 8am to 7:30pm daily, except for Tuesdays. The grounds close earlier in winter. The English Garden is open for guided tours more or less hourly (10am to 4:30pm daily). The grounds of the royal palace also house the historic San Leucio silk factory; today it’s the Silk Museum, with original looms and historic machinery on display. Visit the Versailles of Italy with this entrance ticket to see the Royal Palace of Caserta outside Naples. Tour the opulent palace that was once a private home of the Bourbon Kings and is now a UNESCO World Heritage Site. See the royal apartments, galleries of paintings and the Palatine Chapel before you stroll the magnificent gardens. Take a trip out to the massive Palace of Caserta, a UNESCO World Heritage site celebrated for its Baroque design and massive size (it's the largest royal residence on earth), with this day trip, you'll get skip-the-line access, allowing you to head straight in to the palace to explore its numerous apartments and huge gardens with the help of an audioguide. Spend the day exploring one of the world’s largest palaces—and a UNESO World Heritage Site—when you embark on a full-day tour of the Royal Palace of Caserta from Rome. With just a small group for company, you’ll travel in a comfortable, air-conditioned minivan; hotel pickup and drop-off are also included. Upon arrival, explore the palace’s interior, see its photo-ready gardens, and break for lunch in a traditional local restaurant. With over 1,200 rooms, making sure you see the best of the Royal Palace of Caserta can be a challenge. 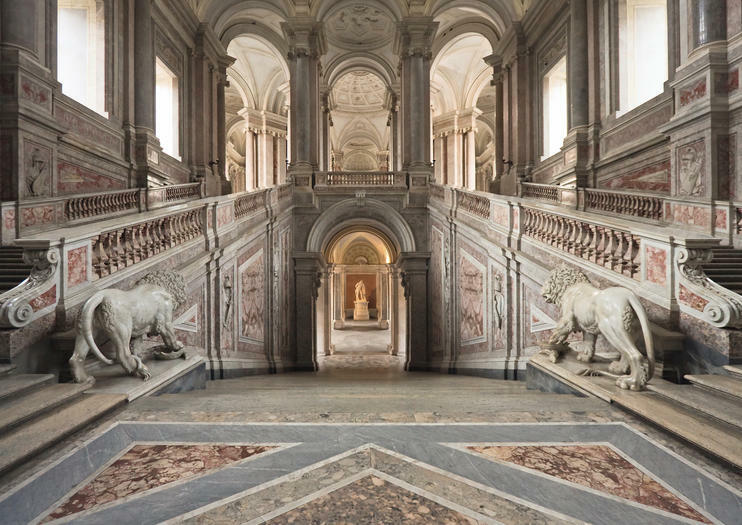 Enhance your experience of the world’s largest royal palace and receive undivided attention from a personal guide on a private tour of the UNESCO-listed Royal Palace of Caserta, which covers palatial highlights such as the Throne Room, the Painting Gallery, the Fountain of Diana, and the Royal Apartments. Upgrade to include hotel pickup and drop-off at your Naples hotel. When visiting Rome, take a full-day detour to the magnificent Royal Palace of Caserta, the former residence of the kings of Naples and one of the largest the royal palaces in the world. Tour some of the estate’s 1,200 rooms ornately adorned with 18th-century tapestries, frescoes, and mirrors, and stroll through the vast Italian and English gardens with a guide. Round-trip transport from Rome and lunch at a restaurant are included for a seamless, regal adventure. Visit the magnificent Royal Palace of Caserta, a UNESCO World Heritage site, with private round-trip transport from the Amalfi Coast. Ensure a hassle-free trip with pickup from your Amalfi, Ravello, Maiori, or Positano hotel; relax in a comfortable private vehicle on the around 2-hour drive; then enjoy around four hours of free time to visit the palace independently. Combine history and shopping in one day with this combo excursion from Naples. Start the day with a trip to Caserta, and step inside the so-called Italian Versailles, the Palace of Caserta. After exploring the UNESCO World Heritage Site, refuel with pizza at La Reggia Designer Outlet, and then shop ‘til you drop in the afternoon. The popular outlet features cult clothing brands and designer labels like Michael Kors and Armani with discounts of up to 70 percent. Entrance to the palace is payable on the day. Combine Italian history and shopping on this private tour from Naples to the Royal Palace of Caserta, followed by a stop at La Reggia Designer Outlet. Built for the Bourbon King of Naples, the UNESCO World Heritage–listed palace is known for its baroque-style architecture and vast parkland with more than 3,200 yards (2,926 meters) of fountains, gardens and a waterfall. Please note: Entrance fee is not included. Visit the Royal Palace of Caserta, a UNESCO World Heritage Site, during this private 4-hour trip from Ravello, Maiori, or Amalfi. Travel in a private Mercedes vehicle with a dedicated guide to one of the largest royal residences in the world, where you can explore at your leisure. Hotel pickup and drop-off included on this private tour for just you and your party. Learn more about the Royal Palace of Caserta than the general public on a private tour of its opulent gardens and interior. In addition to navigating the vast grounds for you, your guide provides background information often unheard by visitors about the castle’s history, architecture, and secrets. A skip-the-line admission ticket is included for your convenience. Benefit from personalized attention and the ability to travel at your own pace on this private tour of the Royal Palace of Caserta in Trani. Listen to guided commentary detailing the history and architecture of the palace. Ask plenty of questions and enjoy the undivided attention of your guide. Spend the day exploring Pompeii and the Royal Palace of Caserta on a private, full-day tour from Rome. Your English-speaking guide picks you up at your hotel for a comfortable three-hour drive to Pompeii. Explore the ancient ruins on your own or your driver can arrange a guide. Next, continue on to Casertavecchia for a traditional Italian lunch and a visit to the Royal Palace of Caserta. Discover the Baroque architecture and manicured gardens before returning to Rome. Customers will visit Naples, the most beautiful city of Campania, discovering it in all its splendor through walks in the historic center, which includes museums and squares, such as Piazza Plebiscito and the Capodimonte museum. the historic center is one of the three parts where the beautiful Naples is divided, there are in fact the immense streets dedicated to shopping, such as via Toledo and San Gregorio Armeno and the most breathtaking part of Naples, that landscape, with incomparable scenery in Mergellina and Posillipo. After the unique visit to Naples, we will reach Caserta, another city rich in history and architecture, famous for its majestic palace built by Vanvitelli, now a UNESCO heritage and called the little Verseille. from this it takes the name of the largest shopping center in the area, the outlet of the building, where customers will spend time between shops and shops. Through a tour of the largest royal palace in Europe, you will experience court life: boardrooms and private rooms will reveal curiosities and anecdotes about the different dynasties that succeeded to the throne of the kingdom of Naples.At the end of the visit, I will make an introduction to the park of the Reggia that you can visit freely as it is included in the admission ticket. "The Park's Garden are wonderful, they are in perfect harmony with a flap of land which is all a garden", so narred Goethe in 1787. If you so desire to be enchanted by the beauty of the XVIII century Borboni royal palace, from its interior to the magnificence of the italian park and english garden, do not miss this unique opportunity. With its five floors, equipped with 1200 rooms, 34 stairs and 1742 windows, the royal palace is the largest in the world, noted in 1997 on Unesco's World Heritage List. The palace opera architect Luigi Vanvitelli, (son of a very important painter of Gaspar Van Wittel sites, already active in Rome under Benedict XIV in restoring th St. Peter's Dome), infact, can be considered to all as an ideal and original fusion of two other royal residence: the royal palace of Versailles of the king of France and the palace of Escorial Madrid, residence of the king of Spain. A beautiful walk from the main avenue will lead us into one of the most beautiful royal residences.From the entrance, thanks to a telescope perspective, we will have a splendid view of the park and its gardens.Through the grand staircase we will head to the Upper Vestibule, which will reveal the particular Cappella Palatina and the sumptuous apartments of the 18th and 19th centuries.We will visit together the largest royal residence in Europe, commissioned by the Bourbons and designed by the great Vanvitelli. GoinItaly's signature nine-day small group tour will take you deep into the culture of Southern Italy while enjoying everything the Amalfi Coast and the Campania region has to offer: food, wine, history, and stunning landscapes.Highlights:• Guided tours by local experts to Pompeii, Paestum, and Caserta.• Wine tasting on the slopes of Mount Vesuvius.• Visit Amalfi, Ravello, and Positano.• Cooking class and lunch with a local grandmother.• Free day with optional day excursions to Capri, Capua, or hike on the Path of the Gods.• Walking tour in the historical center of Naples with pizza lunch. Transfers will all be carried out with specialized drivers who will guarantee maximum punctuality, professionalism and courtesy that will accompany the customer to their destination, guaranteeing absolute safety and comfort aboard one of our luxury vehicles including Mercedes vans or sedans. Royal Palace of Caserta is a royal palace with a park attached to it, located in Caserta. It is the largest royal residence in the world and the historical owners were the Bourbons of Naples, in addition to a short period when it was inhabited by Murat.In 1997 was declared by UNESCO, along with the aqueduct of Vanvitelli and the complex of San Leucio, World Heritage Site In 2016, with a total of 683070 visitors, it was the twelfth most visited Italian state museum site. The Royal Palace of Caserta was commissioned by the King of Naples, Carlo di Borbone, who, struck by the beauty of the Caserta landscape and willing to give a dignified seat of government to the capital Naples and his realm, wanted a palace to be built you can bear comparison with that of Versailles. Visit the Royal Palace of Caserta with this private transportation from Naples. Travel with a private driver to the UNESCO World Heritage–listed former royal residence, built for the Bourbon King of Naples, where you have time to explore on your own to take in its baroque-style architecture and vast gardens. This is a transfer service only; entrance fees are not included.